I found this funny cartoon (attached below) via this blog. 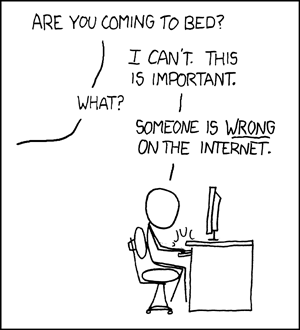 Cartoon by xkcd and licenced under Creative Commons Attribution-NonCommercial 2.5 License. I’ve been using Hulu, a website offering streaming full length TV shows for free, quite a bit recently. Hulu is made up from NBC and News Corporation (FOX). The main television show I have been watching is Family Guy; I have also been watching a couple of episodes of Monk, and Bones. Other shows that are available I watch on normal TV anyway, so there’s no point in doubling up. The best thing I like about this service is that there are very few ads during what would be an hour show with full ad breaks. You may wonder how a New Zealand-citizen is accessing the content that is supposed to be locked to all non-US based IP addresses. Good question. I am using a service first highlighted to me by fellow New Zealand blogger, James Fleet, at Half-Geek. I’ve enjoyed my experience with Hulu so far, and I hope more television networks hope on board this site to make it even better. The only thing they could change is make it into an archive service as well, instead of removing shows after they’ve aired for a set time-frame. New Zealand’s local television on demand service doesn’t remove television shows once they have been uploaded, and they are set to make all their content they carry free and without DRM protection once downloaded. The Pirate Bay to be The Criminal Bay? Popular file-sharing site, The Pirate Bay, is facing court action in its host country, Sweden. The four men who run the site face charges of conspiracy to break Swedish copyright law. BBC has the article in full.